HydroPack is a kit for fast and easy wet underfloor heating installation and it comes with everything you need to install the system in hours. It is an ideal solution for small projects of 22m² or less (additional products are available for larger rooms), providing a maximum heat output of up to 3kW. 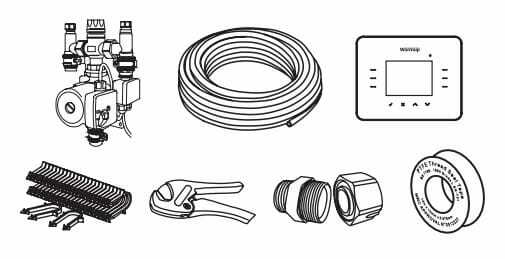 The kit includes the Warmup 3iE hydronic thermostat, the PE-RT pipe plus all the components necessary to complete a successful underfloor heating installation. All the components are compatible and from a single source, packaged in one convenient kit for fast and easy installation with no need to source the components separately. As with all hydronic systems, check that the heat source is compatible with an underfloor heating system and has the sufficient capacity to supply sufficient energy for the Hydropack and other system requirements. All the components are compatible and from a single source, packaged in one convenient kit for fast and easy installation with no need to source the components separately. As with all hydronic systems, check that the heat source is compatible with an underfloor heating system and has the sufficient capacity to supply sufficient energy for the Hydropack and other system requirements. If you accidentally damage the underfloor heating pipe during installation, return it to Warmup and we will replace it with the same size and make pipe free. This product comes with a comprehensive warranty of fifty years on the pipe. We are completely confident in the standard of our products. Before commencing installation, ensure the insulation is laid on a clean and level subfloor. A perimeter strip or edge insulation will need to be laid around the perimeter of the room. The insulation should conform to building regulations or practices and laid as per manufacturers instructions. The compact control and pump unit should be wall mounted in a vertical position on a suitable wall. Choose a suitable & solid mounting location, ensuring adequate clearance for primary and underfloor heating pipework and accessibility of the control unit. Begin to unwrap and uncoil the pipe from the inside centre of the coil, cut the end off with the cutters to leave a neat square cut, but leaving a rounded pipe (i.e. not compressed). Once the pipe has gone through the compression fitting, insert the pipe into the flow from the mixer pump assembly for the underfloor heating. Refer to installation instructions . Once connected, begin laying the pipework around the room using the preferred pipe pattern (see examples below). Take care to turn the coil of pipe as you uncoil it to relieve tension and staple the pipe using the pipe clips provided into the insulation. An allowance of 5 clips per linear metre of pipe has been included. However less clips may be required on the straight runs and more required on the loops. Once the pipework has been laid, work out where to cut the pipe for the final connections to the pump/mixer kit. Insert into the final compression fitting and connect to the pump/mixer valve. Tighten the compression fittings. First the pipework will need to be filled and flushed with fresh cold water from the mains supply. Connect your hose to the flow side of the mixing valve that will be connected to the main flow from the heating system. Connect a hose to the return side of the mixing valve, that will flow back to the heat source for reheating. Place the mains water supply and flush through with the mains water until no air bubbles can be seen in the discharge of water. Using a pressure testing kit (available for hire from your local plant/test hire or purchase from your local plumbers merchant), connect to the red valve and open. Build the pressure up to 6 Bar and hold for 1 hour. Once the test is complete then the system needs to be left under pressure during the screeding process. At least 2 Bar pressure is recommended for the process. This way if the pipework is damaged a leak and drop in pressure will be shown, then remedial repair work can take place as required. Once the system has been installed and pressure tested it should be protected by laying the floor screed as soon as possible. If using a standard sand/cement screed, a thickness of between 65mm & 75mm on top of the insulation is recommended. The screed & screeding works must comply with current Building Regulations and attention must be paid to the curing times. Under no circumstances should the underfloor heating system be used to force curing of the screed. The mixing valve on the control pack should be set to the minimum temperature when commissioning commences after the screed has cured as per manufacturers instructions. Run with the heat on continuously for 3 days, after this a steady increase of 2-3°C per day can be adopted upto the desired working temperature. Then run for a further 4 days at this temperature. Ensure relative humidity of the screed is correct before laying floor finishes.